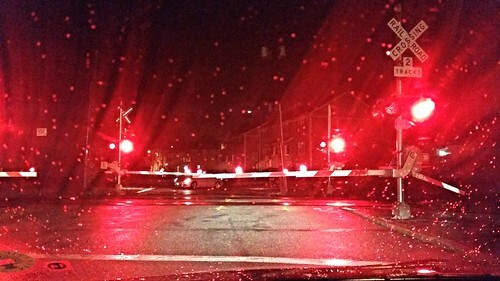 A photo taken from inside of a railroad crossing with its posts down and lights flashing, warning of a train coming. It struck me to take this photo; the calm before the train when the arms come down and you await to see if the train is actually coming. What I liked about the image here is not so much just the railroad crossing but that it is taken from inside the car, which layers it with rain spots and a glare that adds a filter of its own to the image. I find the blinking red lights also curious in that the ones on the right are at almost full radiance while the left ones just have an inkling of a light. They haven't gone out entirely, but are clearly retracting.